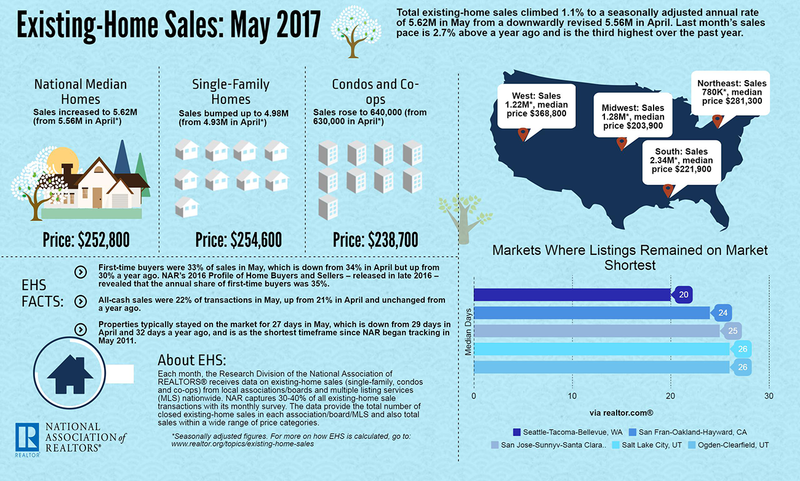 May existing-home sales rose 1.1 percent to a seasonally adjusted annual rate (SAAR) of 5.62 million -- up from 5.56 million in April. After a “notable decline” in April, existing-home sales are back on track with a record high in median home prices and a record low for the median days on market. In May, the National Association of Realtors existing-home sales rose 1.1 percent to a seasonally adjusted annual rate (SAAR) of 5.62 million — up from a downwardly revised 5.56 million in April. Total housing inventory experienced a small boost as well, with a 2.1 percentage point jump to 1.96 million homes for sale. Despite the increase, inventory is still 8.4 percentage points below May 2016 and is the 24th consecutive month of year-over-year declines. Unsold inventory is at a 4.2-month supply, a 0.5 percent year-over-year decline. NAR Chief Economist Lawrence Yun says the month’s existing-home sales show the resilience among consumers who are determined to overcome challenging market conditions. “The job market in most of the country is healthy and the recent downward trend in mortgage rates continues to keep buyer interest at a robust level,” Yun said. Distressed sales, which include foreclosures and short sales, were at 5 percent — unchanged from April, and a 1 percentage point drop from May 2016. Four percent of May sales were foreclosures, and 1 percent were short sales. Existing condominium and co-op sales rose 1.6 percentage points to a SAAR of 640,000 units, 3.2 percentage points higher than a year ago. The median existing condo price was $238,700 in January — up 4.8 percentage points from 2016. In the Northeast, existing-home sales jumped 6.8 percent to an annual rate of 780,000 million, up 2.6 percent from a year ago. Median price: $281,300, a 4.7 percent year-over-year increase. In the Midwest, existing-home sales fell 5.9 percent to an annual rate of 1.28 million. Median price: $203,900, a 7.3 percent year-over-year increase. In the South, existing-home sales rose 2.2 percent to an annual rate of 2.34 million. Median price: $221,900, a 5.3 percent year-over-year increase. In the West, existing-home sales increased 3.4 percent to an annual rate of 1.22 million. Median price: $368,800, a 6.9 percent year-over-year increase.